Hey friends! Hope everyone is having a wonderful week so far! With the holidays fast approaching and our weather all over the place I've been dressing not only super comfy but also in layers. So, if you follow me on Instagram you've probably seen this camo shirt... well, a few times. That's because I definitely have been wearing it on repeat lately. It's the perfect comfy layering piece for these fall days. The material is actually really soft and cozy which makes me want to basically live in it and it looks amazing with jeans, shorts and even dresses! For this look, I kept it super casual and threw the camo shirt on over a comfy tee and white skinny jeans to keep warm since it was a bit breezy and cool out. I've been rocking my white jeans on repeat lately just to add a bit of brightness to my wardrobe but still keep my outfits neutral. Ya'll know how much I love neutrals! I did a bit of pattern mixing with my striped smoking slippers which I absolutely LOVE. These shoes are so comfy and look cute with everything. I will definitely be buying another pair (or two) of Soludos ASAP! And now it's time for the fun part.... I've teamed up with some lovely bloggers to giveaway a $500 Lululemon gift card just in time for the holidays and that New Year's resolution you have fast approaching! Enter to win using the Rafflecopter widget below! Now…it’s time for a fabulous giveaway! I’ve teamed up with an amazing group of bloggers to give YOU a chance to win: a $500 Lululemon Gift Card, just in time for the first of the year! Simply enter below by completing the rafflecopter. You’ll receive one entry per completion. This giveaway is open internationally and runs until 12/28. Winner will be announced here. Good Luck! Perfect casual outfit, I love that camo top! I love everything about this look! Love the way you styled the camo and those shoes look so comfortable and cute! Omg what a generous giveaway!!! I have been yearning for a pair of lululemon leggings for a longgggg time (I only have one cropped pair - not good for winter!) so I have all my fingers and toes crossed! Loving this look on you!! Need to get on the soludos train! I love this look on you - you pull it off so well! I have been wanting a camo jacket and this one is seriously PERFECTION! Love how you styled it--so casual and cute! 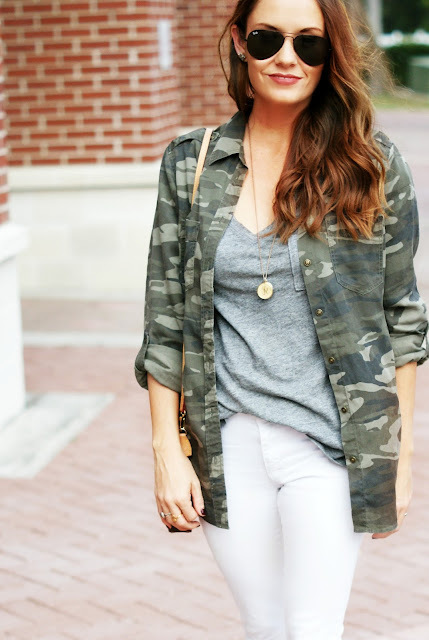 Such a cute look- I always adore a camo piece :) And great giveaway! I can already feel my "get healthy" resolution coming with all my holiday parties this week! Super cute! It also looks cute wrapped around your waist, which is usually what happens to sweaters down here lol. Love this look on you! That tee looks like the perfect fit and color, definitely need to check it out. Love how comfy and so stylish you look! I really need to add some camo to my closet, such a fun print! You make camo look so cute! Love it! I love this top on you and such a great giveaway!!!!! Love the camp with your grey and white! I've been really into camo lately! This jacket is the perfect amount to rock too. That camo is the perfect layering piece for this TX weather! I can totally see why you wear that camo shirt on repeat because it's soooo cute. It's like a great song, you always want to hear it and with that shirt, you always want to wear it. I think the whole out fit is adorable and I love the combination with the colors. Great job! OMG Lulu is a serious obsessed in our home! Pick me pick me!!!! Such a great casual look! The camo looks so fabulous with the grey and white! What a fabulous giveaway and a great way to start off 2017! Loving this cute casual look! That camo shirt is so fab and looks so comfy! The weather really has been so incredibly crazy this year, so layers really are key. 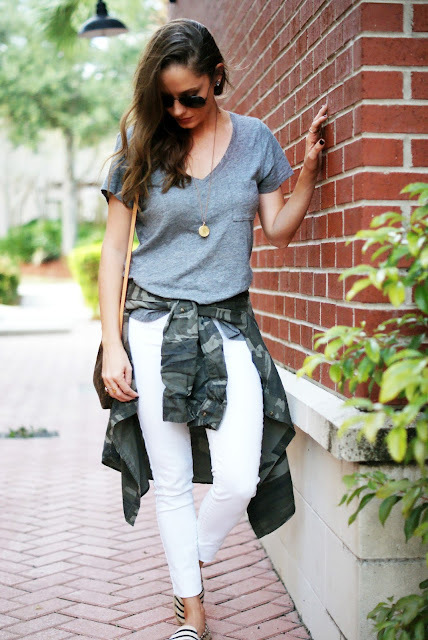 I love how you paired the camo with the white jeans and a neutral shirt too! I love your camo style! super cute look! Fabulous outfit--loving the camo! And a great giveaway too. You pull this off so well! Such a cute & casual look. The camo is so cute with the white denim- and the striped espadrilles are a great touch! This. is the cutest!! Camo and white pants, what a great combo who knew? Thanks for the inspiration! You look gorgeous! Love the pattern mixing - and I definitely still think you're about 5'7! Love this look! You make me wish I brought my camo jacket to Germany! Thanks for joining the linkup this week! I LOVE this shirt and I love how you styled the entire look! Such an awesome giveaway too! I love nothing more than a casual and comfy outfit. The camo shirt is adorable and the sale price is perfect!! I love your outfit you look gorgeous! Love this look! So casual and cool! Thanks so much for taking the time to comment on my blog,I love hearing from my readers! I try to reply to every comment via e-mail so if you don't get a reply from me you might be a no reply blogger!